First, I combined gems with jewelry. The theme I'm working with is fantasy, but it doesn't require a bunch of details on such objects. Each treasure includes a definition for its Jewel dice (dJ). So it might be d4, d6, d10, 3d6... whatever is appropriate. It can have multiples, like 2dJ or 3dJ, which means there are 2 or 3 rolls on the Jewel table. This is the Jewel table. 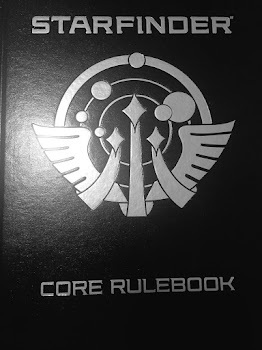 Recall that I use a silver-piece based economy, and also recall that I use exploding dice (so a d4 roll can get a 5 or higher sometimes). Also, 1 GP = 100 SP for me. 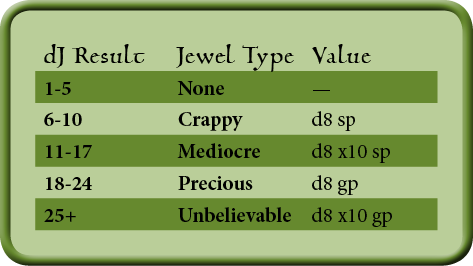 Detailed descriptions of the gem types, filigrees, et al can be provided by the GM, but in the game I'm working on, I think it will usually come out something more like, "You find a crappy amulet on that dead gremlin." This is the sort of whittling I've been doing, and I'm happy with the results so far. I can't wait to play some games and share my results. This is more along my style of gem rewards (if you recall I wasn't the biggest fan of the Phoenix gem system). I've recently been playing a game called Bard's Tale on my Android. That has a reward system where a trash item that drops is immediately sold for it's worth (e.g. a wolf's fur drops and you get 5 silver). Doesn't work immersively, but I love not having to deal with/track grey items in my inventory. Maybe a cut down version of would warrant a similar implementation? Also, is that the Bard's Tale from 1985 remade for Android, or is it a new version?